If there’s one thing we’ve learned as we have helped clients create the kitchens of their dreams, it is this: You can never have enough storage. Custom kitchen cabinets can ensure you make the best use of your space. But, if now just isn’t quite the time for a custom upgrade, no problem. We have here three fantastically creative ways to improve storage in your kitchen, all inspired by some great organization finds on Pinterest. All you have to do is open your cabinet doors. This is downright brilliant. With a few removable Command hooks and a little bit of chalkboard paint, you can turn the back of a cabinet door into a baking center. This allows you to avoid digging for those measuring spoons and cups that all too often find their way to the bottom or back of your baking drawer. To attach, you can either purchase Command hooks or use small, short screws that won’t go all the way through the cabinet door. 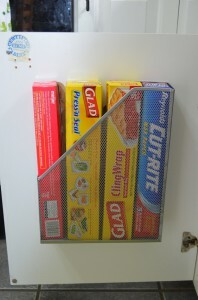 Use Magazine Racks to Store Foil, Wrap, Cutting Boards & More! 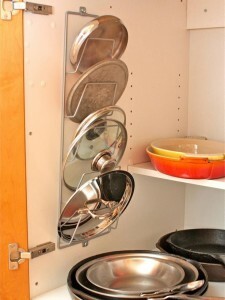 Take a magazine rack and install it on the inside of the door to your pots and pans. You can easily attach these with Command tabs or with small screws that won’t come through the other side of your cabinet. 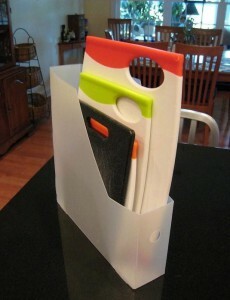 You can also use a magazine holder to store cutting boards, Tupperware lids, or aluminum foil and saran wrap boxes. Finally, you can purchase a fairly inexpensive over-the-door shoe holder that you can put on the inside of your pantry to store snacks, spices and more. What’s Your Favorite Life Hack for Kitchen Storage? Do you have a favorite storage hack that we didn’t highlight here? We’d love to hear about it! Leave a comment here, share your pics with us on our Facebook page or send us a message on Pinterest. Feel free to also send us an email or give us a call! You can reach us at 952-737-7088.